200 anniversary of Patriotic war of 1812 and campaigns in Germany and France in 1813—1815 induced historians to come back to these seemed to be well studied subjects, connected with events of that era. It became clear that despite a huge number of scientific issues, theses, biographies of characters as main (Alexander I, Napoleon I, field marshal M. Kutuzov, a group of Napoleonic marshals and the Russian generals, commanders and statesmen of other European countries), and as though the second plan, a myriad of the most various publications of documents, in the history of the final period of the Napoleonic epic remains many white spots. Many myths which have arisen for two hundred years and a legend about that time which because of their frequent mention turned in it would seem the approved facts are still alive and actual. Moreover, archives of the different countries though they are formally available to historians are insufficiently investigated too. It was confirmed by the numerous scientific conferences took place during 2012 which have found out that for work of historians on a perspective connected with Patriotic war of 1812 and Campaign of 1813—1815 there is a sufficient field. In July, 2012. 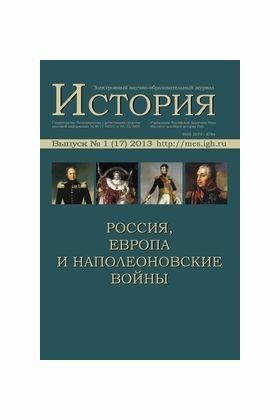 The Institute of World history of the Russian Academy of Sciences held the international conference "The Patriotic War of 1812 in World History" (for more details see published information). In presented issue of the electronic journal some reports given at this conference and which authors in due time provided for the publication will be published. Reports are published in author's edition.